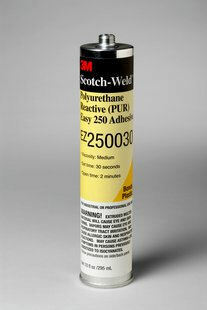 3M™ Scotch-Weld™ PUR Easy Adhesive EZ250030 is a one-component, polyurethane reactive adhesive with exceptionally strong bonds that provide over 1,000 lbs. holding strength. With a fast set time, this 100% solids adhesive is formulated to provide almost immediate handling strength without the need for drying and ventilation equipment.